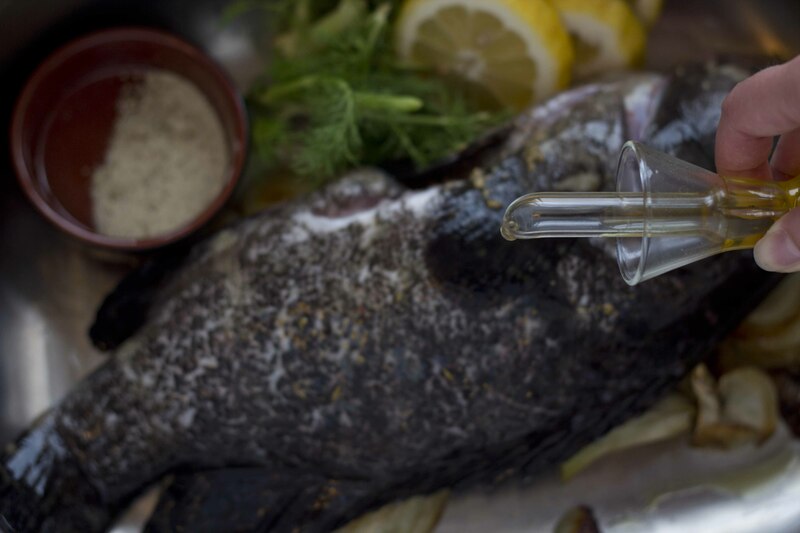 Fennel and fish are a traditional pairing. 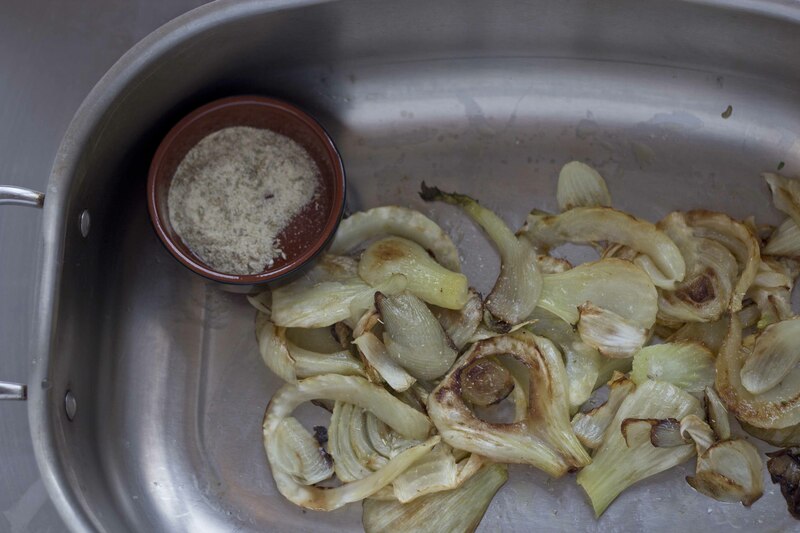 Caramelising the fennel bulb in advance deepens the flavour of the fennel and adds a slight sweetness to the dish. 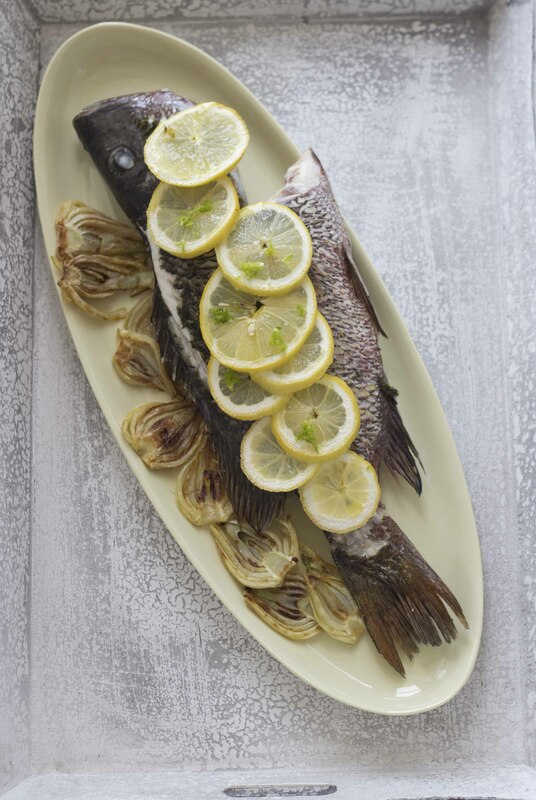 1 kilo sea bass, cleaned (1 or 2 fish)* can substitute grey mullet, red mullet, or striped red mullet for this dish. 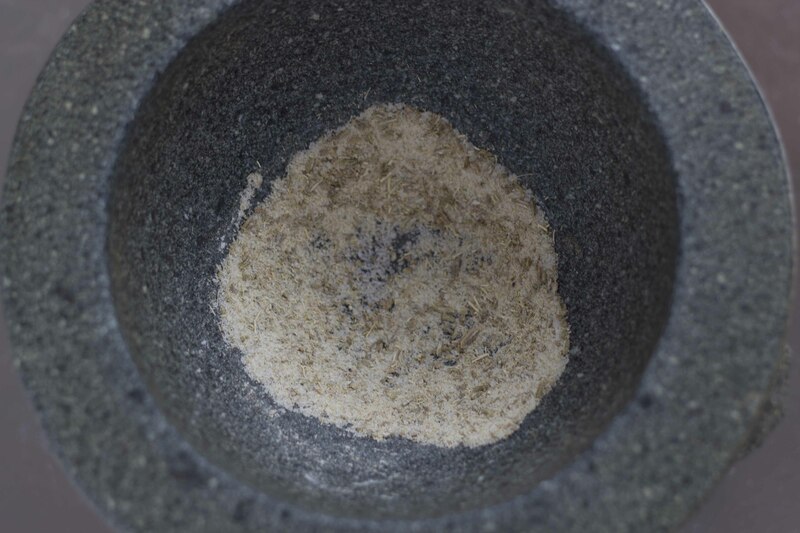 In a mortar and pestle, place the coarse sea salt and the toasted fennel seed. 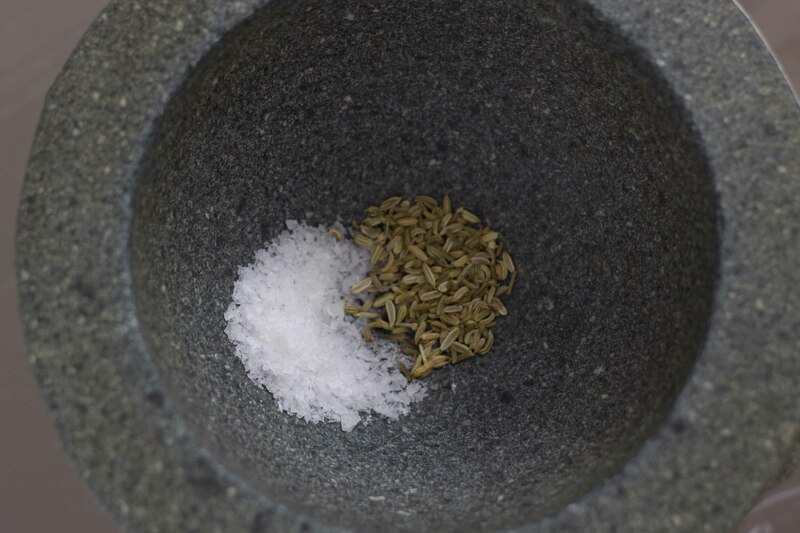 Grind the salt and fennel seed to a powder. Rub a roasting pan or baking dish with 15 mls of olive oil and set aside. Use all but 1 teaspoon of the mixture to rub into the skin and cavity of the fish. 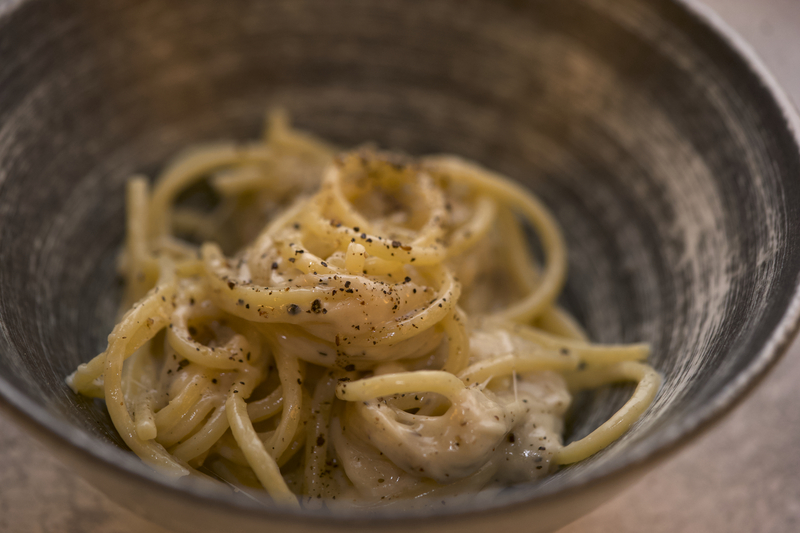 Drizzle the fish with 15 mls of olive oil. Heat a sauté pan over medium heat until warm. 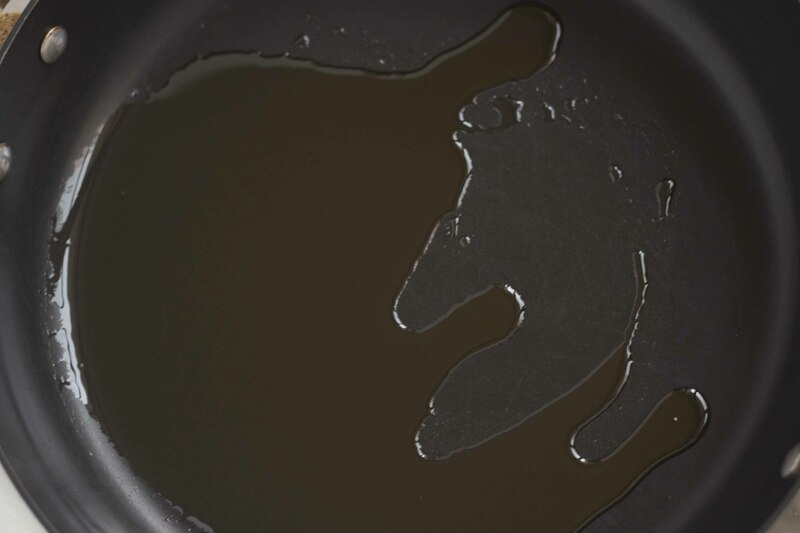 Add 30 mls of olive oil to the pan and turn the heat to low. 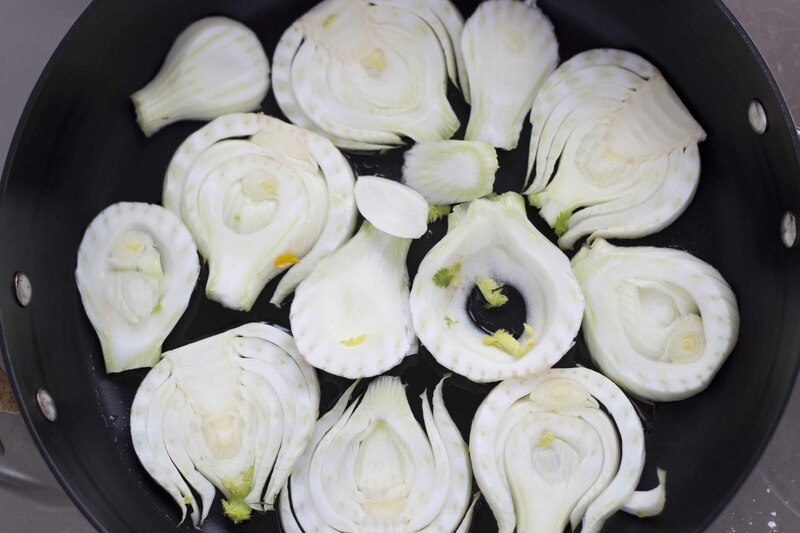 Add the sliced fennel in a single layer to the sauté pan. 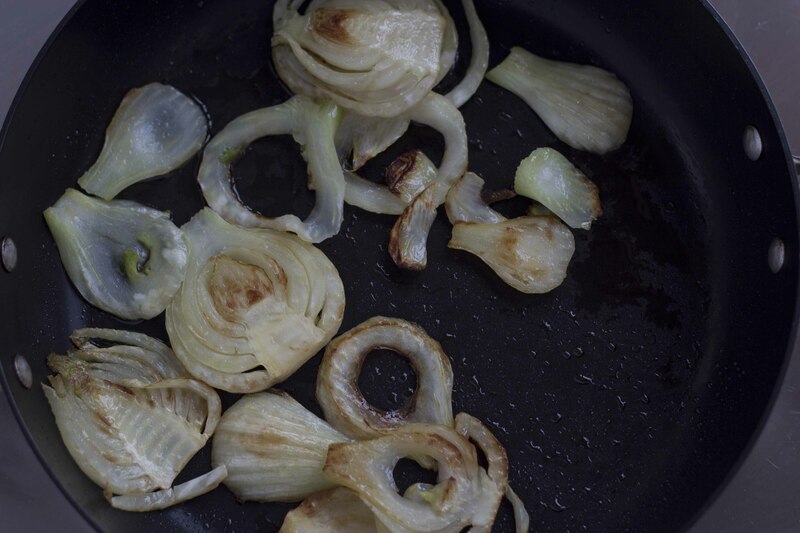 Cover the pan and continue to cook on low heat until the fennel starts to soften, about 5 minutes. Turn the heat up to high and start to brown the fennel, turning as it browns. 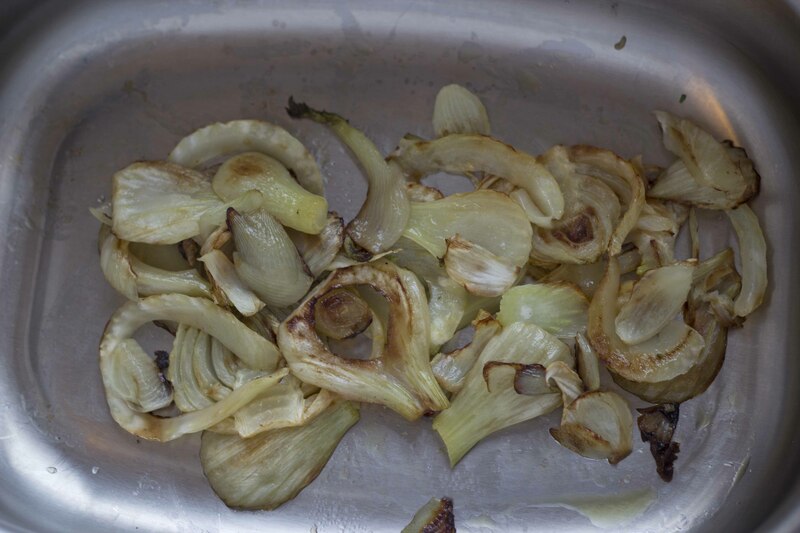 Remove the fennel and place in the prepared roasting pan. Repeat the process until all the fennel is caramelized. Sprinkle the fennel with the remaining 1 teaspoon of fennel salt. 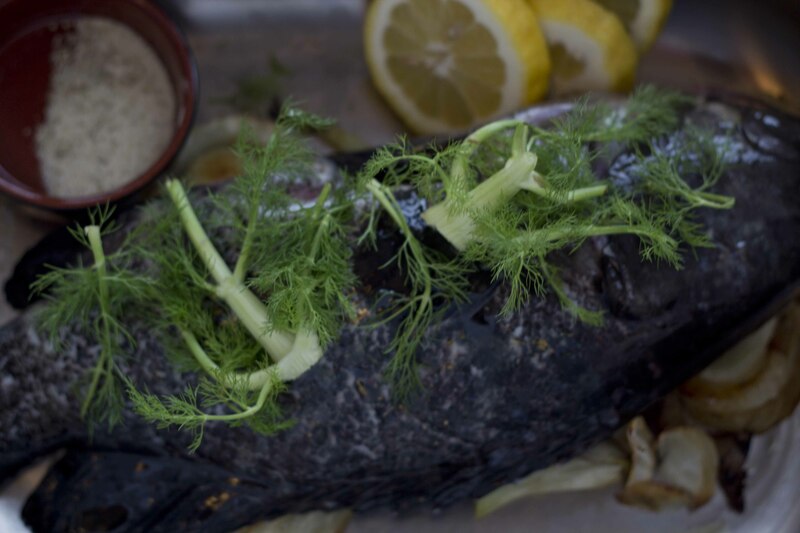 Place the fish on top of the fennel and sprinkle the fennel fronds over the fish. Layer the lemon rounds on top of the fish. 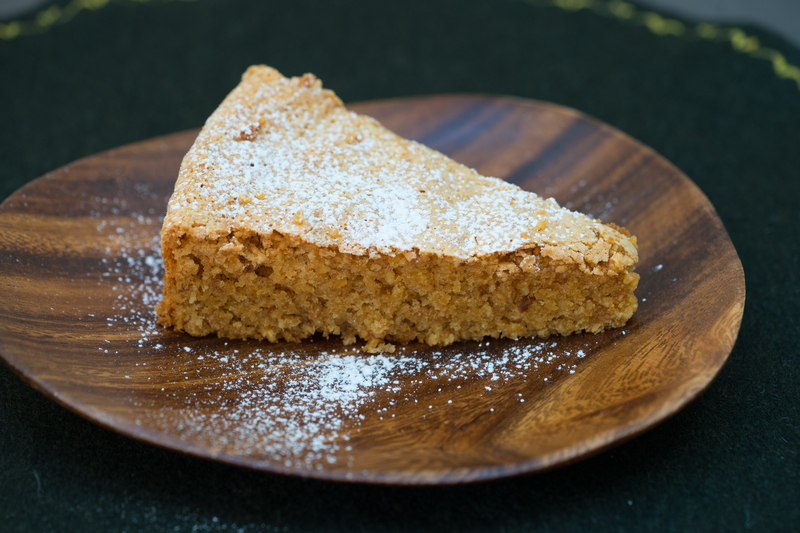 Place the fish in the oven and bake for about 15 to 45 minutes depending on how thick your fish is and if it came out of the refrigerator (i.e. 15 minutes for two room temperature 500 gram fish or fillets and 45 minutes for a thick 1 kilo refrigerated fish). You can place a small knife point in between the top of the spine and try to lift up the fillet and if it separates easily then it is done. 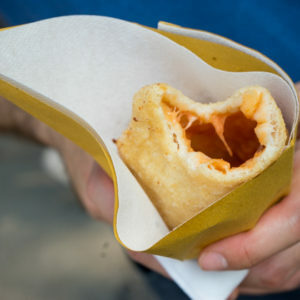 To serve, use a knife to cut down behind the gill and down the backbone, pushing aside the small bones along the back. Run the palette knife down the spine removing the fillet and place on serving plates. Drizzle with olive oil and squeeze some of the juice from the half lemon onto the fish. 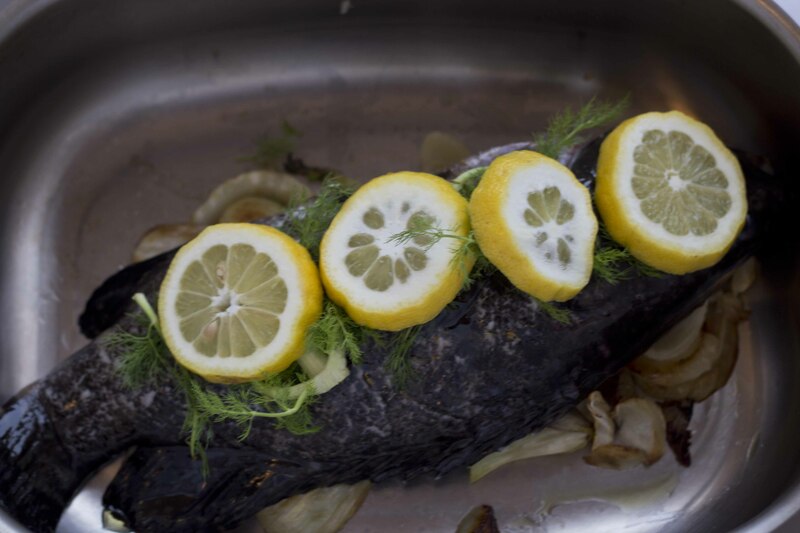 Once the fish is served, discard the bones and scoop up the fennel and serve alongside.